Myrtle Beach is a coastal resort city in Horry County, South Carolina, United States. It is the de facto hub of both the Myrtle Beach metropolitan area and the Grand Strand, a complex of beach towns and barrier islands stretching from Little River, South Carolina to Georgetown, South Carolina. 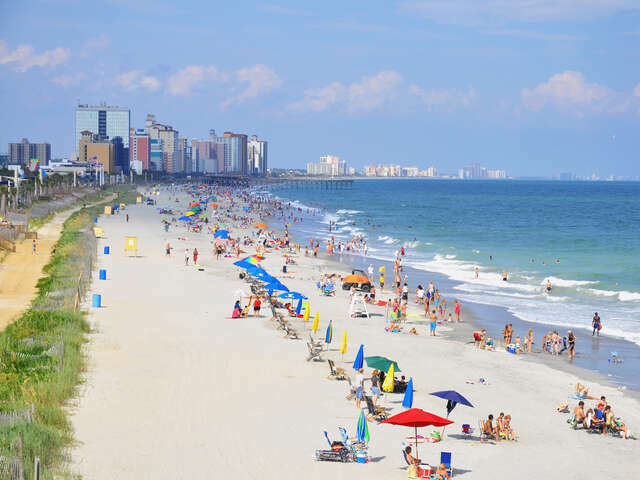 Arising from a getaway for lumber workers from Conway, South Carolina, Myrtle Beach has rapidly developed into a major tourist destination in the Southeastern United States in the late 20th century and 2000s. The estimated 2009 population for the city is 31,968. As of 2009, the metro area had an estimated population of 324,571. According to the 2000 census, the area was the 13th fastest-growing metropolitan area in the United States. That’s Entertainment in Myrtle Beach Myrtle’s plenty of theatre venues. Best Beachfront Restaurants in Myrtle Beach Marina Inn is Myrtle Beach City's premiere dining destination. It is ideal for both family nighouts and romantic dinners. It is popular for its Fish Tacos that are served with a Mango Margarita.